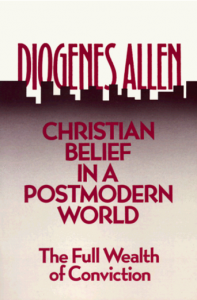 Allen is Professor of Philosophy at Princeton Theological Seminary and is becoming a well-known author and lecturer. This is more a book on apologetics than on postmodernism yet he is arguing for a mode through which we might reach this present generation. Though for Allen, lost man is not compelled to conclude God’s existence through the cosmological method, he is compelled by the two books of Nature and Scripture to search for such a God. His thoughts on the appeal to Justice and Community are helpful in understanding today’s generation. It is disappointing that Allen (teaching in the halls that heard B.B. Warfield and J Gresham Machen) denies the literal account of Genesis 1-12.